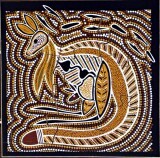 The artist, Charlie Chambers, Jnr was born at Cherbourg in Queensland and was taught to draw by his father. 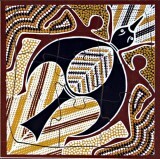 Charlie’s Aboriginal tribal heritage is Kiullill and Kookimijii. 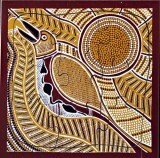 He uses the colours of his country in his art work, and both dotstyle painting from his mother’s people of western Queensland and the cross hatching technique of his father’s people from northern Queensland. 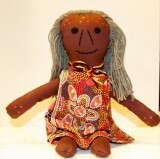 Charlie does storytelling in schools and the community in an effort to pass on Aboriginal stories and art to others. 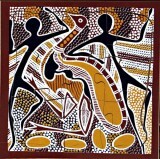 He is a renown artist, whose paintings are on display around Australia and also overseas.